Students of David Moen and Tony Mosca: Conversation with the Artist: Over 300 students of all ages in the Los Angeles area had an opportunity to see their work exhibited in a gallery. As a standard part of every exhibit, we introduce the artist to the audience with our Conversations with the Artists program. A board member introduces the artist to the guests; the artist gives a statement, answers questions, and often provides demonstrations of technique. Some of the artists exhibiting in our galleries present hands-on workshops to our audience. This experience combines theoretical and practical techniques that professional artists demonstrate through guided workshops, to combine with a guest's own understanding of making art. 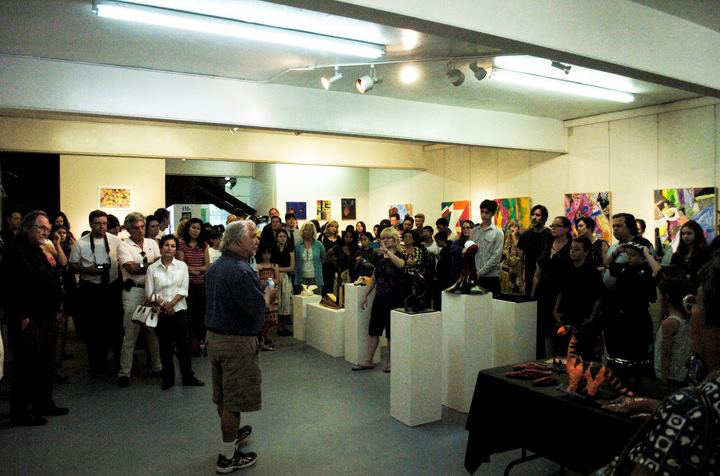 Frequently exhibiting artists present a spontaneous opportunity to offer the public insight into their methods and techniques. Often these workshops include material that is connected to the unique cultural background of the the artist themselves, or public participation is already a central part of the artist's work. 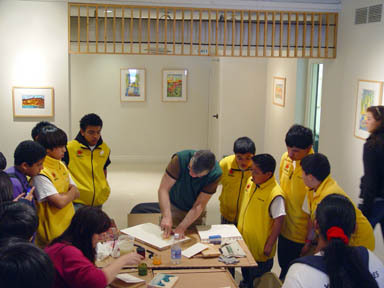 (A) In a highly educational exhibit by master New York printmaker Prawat Laucharoen, guests had the opportunity to create their own prints throughout the exhibit. (B) Internationally reknowned artist Rirkrit Tiravanija prepared food as part of his exhibit for gallery visitors. (C) Ttozoi, in cooperation with the Institute for Italian Culture, brought their organic material painting methods to Artcore. In a time when the local school district can scarcely offer occaisonal experiences with art, we are stepping in to fill a necessary role in the community. Small classes, professional artist-educators, taught within the dynamic environment of a working art gallery. We translate concept into experience delivering critical skills in individual and multi-week workshops. Our latest major youth workshop was taught by lifetime Los Angeles resident, professional artist and educator Luis Becerra. Close supervision with a class of 12, the students built a model of a city, learning about the interactions necessary within a large system, how to collaborate to make parts of a whole, civil planning and a variety of construction and painting skills. The summer class ran twelve two-hour sessions, with three sessions a week, and concluded with an exhibit. Because we believe education is a lifelong process, LA Artcore has developed specialized workshop classes that are directed towards adults. These four week sessions are designed for an audience that wants to understand historical art movements and theories. 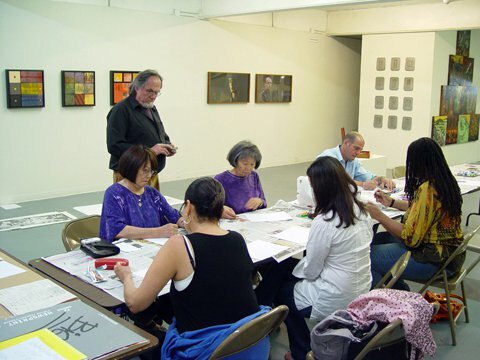 The most recent workshop offered was Understanding Abstract Art, taught by David Moen, lifelong artist and instructor. Each session is designed to be interactive, using language that is easily understood and culminates with a hands- on workshop that reiterates and applies all the concepts learned. We've also conducted tours of several of the primary local Contemporary Art museums in our neighborhood, with guided instruction.